Medieval tale, or romance, describing the adventures and conversations of Solomon and one Marcolf, or Marolf. The adventures have some connection with those of Ashmedai, while the conversations consist chiefly of riddles similar to those put to Solomon by the Queen of Sheba. The exact extent of its indebtedness to the Haggadah is somewhat doubtful, though it is practically certain that the various versions are derived from an Eastern original. 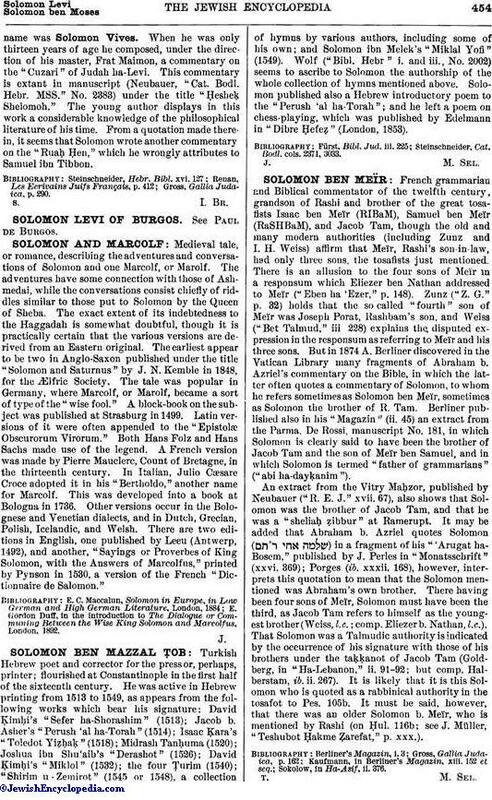 The earliest appear to be two in Anglo-Saxon published under the title "Solomon and Saturnus" by J. N. Kemble in 1848, for the Ælfric Society. The tale was popular in Germany, where Marcolf, or Marolf, became a sort of type of the "wise fool." A block-book on the subject was published at Strasburg in 1499. Latin versions of it were often appended to the "Epistolæ Obscurorum Virorum." Both Hans Folz and Hans Sachs made use of the legend. A French version was made by Pierre Mauclerc, Count of Bretagne, in the thirteenth century. In Italian, Julio Cæsare Croce adopted it in his "Bertholdo," another name for Marcolf. This was developed into a book at Bologna in 1736. Other versions occur in the Bolognese and Venetian dialects, and in Dutch, Grecian, Polish, Icelandic, and Welsh. There are two editions in English, one published by Leeu (Antwerp, 1492), and another, "Sayings or Proverbes of King Solomon, with the Answers of Marcolfus," printed by Pynson in 1530, a version of the French "Dictionnaire de Salomon." E. Gordon Duff, in the introduction to The Dialogue or Communing Between the Wise King Solomon and Marcolfus, London, 1892.